Some engineers are thinking about what humans can do with their brains. 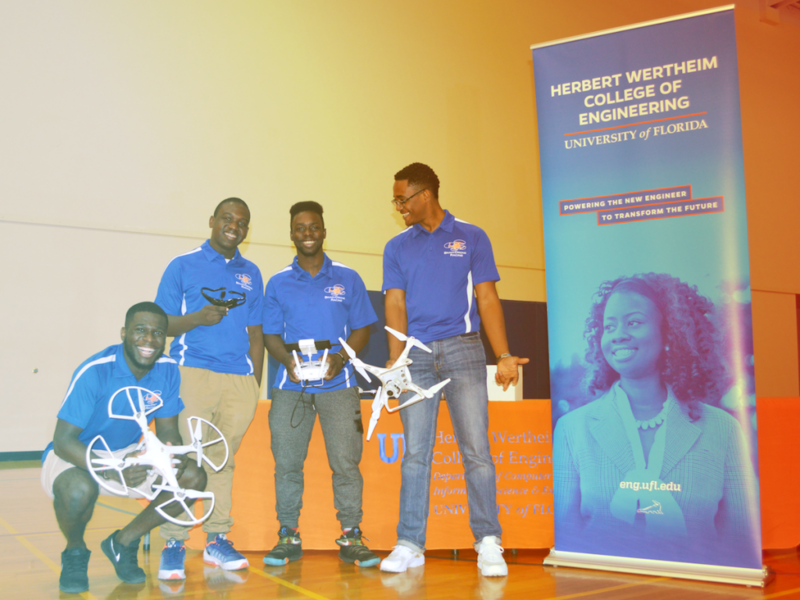 A team of students at the University of Florida, with the help of Juan Gilbert, Ph.D., the Andrew Banks Family Preeminence Endowed Professor and chair of the UF Department of Computer & Information Science & Engineering (CISE), are bringing those ideas to life by controlling drones with their brains. Efforts by Gilbert and his team took flight on April 15 after the group hosted the second annual Brain-Drone Race. About 40 people attended the free event at the Florida Gymnasium on UF’s campus. Ivens Applyrs, the communication lead for the project, was part of the team that hosted this year’s race. He said the team recruited for the “top talent.” A total of 16 participants came to compete. After recording the best times from the simulations, the team selected the racers for the tournament. UF CISE research students mounted black helmet-like devices on each participant. The racers had the ability to control a drone using the apparatus which recorded electrical signals using brain-computer interface (BCI) technology. According to the Brain-Drone Race team’s website, brain-computer interfacing is the utilization of a brain-imaging device for controlling machines with the human brain and to understand the human’s emotional condition or state. Applyrs said the technology was safe for frequent use. The arena was bordered with nets to protect the crowd. Each stage of the tournament was conducted drag-race style and had two to three rounds. While participants geared up for competition, a large display of the event’s live Internet feed played in the background. Grand prizes for the winners included Beats by Dre headphones, a $50 Amazon gift card, an Apple watch, and the official Brain-Drone Race trophy, which was created from one of the 3-D printing labs at UF, according to Applyrs. The first-place winner was a student named Mahdi Moqri, a Ph.D. student who is studying information systems. The second-place winner was Megan Mackool, a third-year electrical engineering major. The third-place winner was Anthony Colas, a recent UF alumnus who studied computer engineering. Moqri won the trophy and chose the Apple watch. Mackool went home with the Beats by Dre headphones. When asked if the races were easy for him, Moqri said it was not easy at all. Stanley Celestin, the software engineer on the UF CISE research team, said he was happy to see how Gilbert’s research can be applied to the real world. He also said he was relieved to see how the group’s project turned out.